An in vitro dye leakage study was carried out to compare the apical microleakage of vitapex (calcium hydroxide based paste) when used with single gutta percha cone with that of dentalis KEZ (calcium hydroxide and zincoxide eugenol based sealer) and zincoxide-eugenol sealer when used with laterally condensed gutta percha obturation technique. One hundred single rooted human anterior teeth were instrumented and randomly divided into three experimental groups of 30 teeth each and two control groups of 5 teeth each. Teeth in the first group were obturated using a single master gutta percha cone and vitapex as root canal sealer and those of second group were obturated with laterally condensed gutta percha using dentalis KEZ as sealer. Third experimental group was filled with laterally condensed gutta-percha using zinc-oxide eugenol as sealer. Teeth were then suspended in 2% methylene blue. After this, teeth were demineralized dehydrated and cleared. Linear dye penetration was determined under stereomicroscope (x10) with calibrated eye piece. Results of this study showed that calcium hydroxide based endodontic material leaked comparatively less as compared to zinc oxide Eugenol sealer. Vitapex with single gutta-percha cone provided an adequate apical Seal against dye penetration. Secondary bone grafting in cleft lip and palate patients is performed preferably before the eruption of permanent canine in order to provide adequate periodontal support for eruption and preservation of the teeth adjacent to the cleft. Presented here with is a case of unilateral cleft lip and palate, which was followed up from birth to 15 years of age. The role of an orthodontist in the team approach for management of such anomalies is described. Also discussed in detail is the entire range of treatment procedures the child underwent, especially the role of secondary bone grafting. The present study was conducted to compare and evaluate the tensile strength of silver soldered joints of stainless steel and cobalt-chromium orthodontic wires with band material. An attempt was made to observe the effect of joint site preparation by incorporation of tack welding and increasing metal to metal surface contact area by flattening an end of the wire prior to soldering along with the regularly used round wires without tack welding. A total of 180 wire specimens were soldered to 180 band specimens. Fifteen samples according to joint site preparation were included for each of the wire groups i.e. Gloria (S.S.), Remanium (S.S.) and Remaloy (Co-Cr) wires of 0.036" in diameter. The findings of the study were suggestive that all three wires may be used for preparing silver soldered joints irrespective of the quality of the wire. However, when subjecting the wire to joint site preparation, Gloria (S.S.) wire showed less tensile strength as compared to Remanium and Remaloy. Numerous causes for bilateral parotid swellings have been identified. It must be assumed that systemic factors play a key role, thereby the attainment of a definitive diagnosis requires a familiarity with full range of possible etiologies for these swellings. Differential diagnostic skills must be implemented to achieve a precise diagnosis. A case of bilateral parotid swelling in a child is presented and differential diagnosis is discussed. Chronic mucocutaneous candidiasis is a immuno deficiency disorder primarily due to T cell dysfunction characterized by persistent candidal infection of mucous membrane, skin, scalp and nails. Chronic mucous membrane candidiasis has an onset in infancy or childhood; the primary affected site is the oral cavity; however, lesions may occur on trunk, hands, feet and scalp. This paper describes a 12-year-old girl with candidial infection of the oral mucosa and extra oral involvement of fingers, nails, toes and intertragus area. 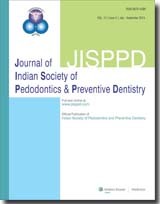 The aim of this study was to compare the efficacy of lyophilized freeze dried platelet derived preparation with calcium hydroxide as pulpotomy agents in primary molars. Fifty six primary molars in 28 children were treated by a conventional pulpotomy technique. 28 teeth were treated by lyophilized freeze-dried platelet derived preparation and another 28 by calcium hydroxide. Clinical evaluation was carried out out at 1, 3, and 6-months interval and the radiographic evaluation was carried out at 1 and 6-months. The success rate of lyophilized freeze-dried platelet derived preparation proved better than calcium hydroxide. Talon cusp is a supernumerary crown structure, a developmental disturbance in the shape of teeth that causes various diagnostic, functional and esthetic problems. Some synonyms for talon cusp are dens evaginatus of anterior teeth, interstitial cusp, tuberculated tooth, odontoma of the axial core type, evaginated odontoma, enamel pearl, supernumerary cusp etc. The lingual location on incisors, which frequently affects occlusion, is pathognomonic of the talon cusp. This report describes a rare odontogenic, isolated anomaly rather than an integral part of any disorder, a case of talon shaped cusp projecting from the labial surface of a maxillary permanent central incisor. The efficacy of ultrasonic toothbrush and a manual toothbrush was compared on the oral hygiene status and on microbial parameters. 26 dental students from the College of Dental Sciences Davangere, Karnataka, were selected for this single blind study of 4 weeks duration. The participants were in the age group of 18-25 years. The brushes were randomly allotted by the co-investigator, who also supervised the brushing technique throughout the study period. The subjects were instructed to refrain from brushing their teeth for 12-14 hours prior to each follow up visit. The main investigator assessed all the clinical parameters at baseline, 14th, 21st and 28th day. Statistical analysis was carried out by an independent statistician who remained blind to the test products. Each of the tooth brushes tested, showed significant reductions in all the clinical parameters between 0 and 28th day. The reductions within the groups were significant although no significant differences between the groups were found. The reductions in stain index, bleeding index and gingival index was higher in ultrasonic toothbrush compared to manual toothbrush. It is concluded that ultrasonic toothbrush is safe and effective in the removal of plaque, stains, reduction of gingival inflammation and gingival bleeding. Pediatric dentists often come across lesions in neonates, the most common ones being Bohn's nodules and Epstein Pearls. Other common lesions seen in the oral cavity of neonates are congenital epulis, hemangiomas and mucus extravasation cysts. Mucus extravasation phenomenon is generally encountered over the lip but rarely seen over the alveolar ridge. Presented here is a case of a 1-month-old baby with a mucus extravasation cyst measuring 0.7 x 1 cm in size over the alveolar ridge.